The kingdom was formed about the year 520 by the merging of the North and the South Folk (Angles who had settled in the former lands of the Iceni during the previous century) and was one of the seven Anglo-Saxon heptarchy kingdoms (as defined in the 12th century writings of Henry of Huntingdon). For a brief period following a victory over the rival kingdom of Northumbria around the year 616, East Anglia was the most powerful of the Anglo-Saxon kingdoms of England, and its King Raedwald was Bretwalda (overlord of the Anglo-Saxons kingdoms). However, this did not last and over the next forty years East Anglia was defeated by the Mercians twice and continued to weaken in relation to the other kingdoms. Finally, in 794, Offa of Mercia had king Æthelberht killed and took control of the kingdom himself. Although independence was temporarily restored by rebellion in 825, on 20 November 869 the Danes killed King Edmund and captured the kingdom (see Ivar the Boneless). By 917, after a succession of Danish defeats, East Anglia was incorporated into the Kingdom of England by Edward the Elder, afterwards becoming an earldom. Despite some engineering work in the form of sea barriers constructed by the Roman Empire, much of East Anglia remained marshland and bogs until the 17th century. From this point onward a series of systematic drainage projects, mainly using drains and river diversions along the lines of Dutch practice, converted the alluvial land into wide swathes of productive arable land. In the 1630s thousands of Puritan families from East Anglia settled in the American region of New England, taking much East Anglian culture with them that can still be traced today. East Anglia, which based much of its earnings on wool, textiles, and arable farming, was a rich area of England until the effects of the Industrial Revolution saw manufacturing and development shift to the Midlands and the North. During the Second World War, the Royal Air Force and the United States Army Air Forces constructed many airbases in East Anglia for the heavy bomber fleets of the Combined Bomber Offensive against Nazi-occupied Europe. East Anglia was ideally suited to airfield construction as it comprises large areas of open, level terrain and is close to mainland Europe. The reduced flight time to mainland Europe therefore reduced the fuel load required and enabled a larger bomb load to be carried. Building the airfields was a massive civil engineering project and by the end of the war there was one approximately every 8 miles. Many of these airfields can still be seen today, particularly from aerial photographs, and a few remain in use today, the most prominent being Norwich International Airport. Pillboxes, which were erected in 1940 to help defend the nation against invasion, can also be found throughout the area at strategic points. 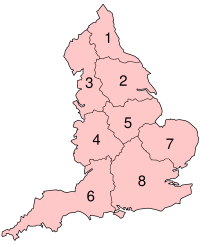 East Anglia is bordered to the north and east by the North Sea, to the south by the estuary of the River Thames and shares an undefined land border to the west with the rest of England. Much of northern East Anglia is flat, low-lying and marshy (such as the Fens of Cambridgeshire and Norfolk), although the extensive drainage projects of the past centuries actually make this one of the driest areas in the UK. Inland much of the rest of Suffolk and Norfolk is gently undulating, with glacial moraine ridges providing some areas of steeper areas relief. The supposed flatness of the Norfolk landscape is noted in literature, such as Noël Coward's Private Lives – "Very flat, Norfolk". Major rivers include Suffolk's Stour, running through country beloved of the painter John Constable, and the River Nene. The River Cam is a tributary of the Great Ouse and gives its name to Cambridge, whilst Norwich sits on the River Yare and River Wensum. The River Orwell flows through Ipswich and has its mouth, along with the Stour at Felixstowe. The Norfolk and Suffolk Broads form a network of waterways between Norwich and the coast and are popular for recreational boating. The Ouse flows into the Wash at King's Lynn. The climate of East Anglia is generally dry and mild. Temperatures range from an average of 1–10 °C in the winter to 12–22 °C in the summer, although it is not uncommon for daily temperatures to fall and rise significantly outside these averages. Although water plays a significant role in the Fenland and Broadland landscapes, the area is among the driest in the United Kingdom and during the summer months, tinder-dry conditions are frequently experienced, occasionally resulting in field and heath fires. Many areas receive less than 700mm of rainfall a year and this is fairly evenly distributed throughout the year. Sunshine totals tend to be higher towards the coastal areas. The only major commercial airport is Norwich Airport, although London Stansted Airport, the fourth busiest passenger airport in the UK, lies just south of Cambridge in north-west Essex. The University of Cambridge, established at the start of the 13th century and in the town of the same name, is East Anglia's best-known institution of higher learning, and is among the oldest and most famous universities in the world. Other institutions include the University of East Anglia (in Norwich), Norwich University of the Arts, Anglia Ruskin University (based in Cambridge), University of Suffolk (based in Ipswich) and University Centre Peterborough. The three crowns appear, carved in stone, on the baptismal font (c.1400) in the parish church of Saxmundham, and on the 15th century porch of Woolpit church, both in Suffolk. They also appear in local heraldry and form part of the arms of the diocese of Ely and the arms of the borough of Bury St Edmunds, where the crowns are shown pierced with arrows to represent the martyrdom of Edmund the Martyr, the last king of East Anglia. Other users of the arms include the former Isle of Ely County Council, the Borough of Colchester and the University of East Anglia. The flag of Cambridgeshire (adopted in 2015) includes the three gold crowns on a blue field. "Suffolk pink" and similar pastel colours of whitewash are commonly seen on houses in Suffolk, Norfolk and their neighbouring counties. East Anglia has a wide range of holiday resorts that range from the traditional coastal towns of Felixstowe and Lowestoft in Suffolk and Great Yarmouth and Hunstanton in Norfolk, to small fishing villages like Aldeburgh and Southwold in Suffolk. Other tourist attractions include historic towns and cities like Bury St Edmunds, Cambridge and Ely as well as areas such as Constable Country, the Broads and the North Norfolk coast. ^ The First World War memorial at Liverpool Street Station, erected by the London Society of East Anglians, is "to the men of Norfolk, Suffolk, Essex and Cambridgeshire". ^ "Jade Goody and the many faces of East Anglia". BBC News. 15 May 2016. Retrieved 15 May 2016. ^ a b "East of England". Office for National Statistics. The National Archives. 25 March 2010. Archived from the original on 8 January 2016. Retrieved 26 November 2017. ^ "Cambridgeshire and Peterborough devolution deal". GOV.UK. 16 March 2017. Retrieved 26 November 2017. ^ Joel Lamy (24 May 2016). "East Anglia devolution deal could be just days away with talks over geography and elected mayor ongoing". Fenland Citizen. Retrieved 25 May 2016. ^ Huntingdon, Henry; Greenway, Diana (1996). Historia Anglorum: The History of the English People (Reprinted ed.). Oxford: Clarendon Press. ISBN 9780198222248. Retrieved 7 March 2017. ^ Brown, Michelle P.; Farr, Carol A. (2005). Mercia: an Anglo-Saxon Kingdom in Europe. New York: Continuum. p. 228. ISBN 9780826477651. ^ Fischer, David Hackett (1991). Albion's Seed: Four British Folkways in America (Reissue ed.). New York: Oxford University Press. ISBN 978-0195069051. ^ "UK Pillbox, Pillboxes, Bunkers, Anti-tank traps and other Anti-Invasion Defences built in World War 2". Pillboxesuk.co.uk. Retrieved 19 April 2016. ^ Landscape Access Recreation. "Historic Farmsteads Preliminary Character Statement: East of England Region". ^ "Top 50 World Container Ports". World Shipping Council. Retrieved 20 February 2017. ^ Mark Miller (19 June 2008). "Cambridge Announced As National Cycling Town". Cambridge County Council. Wayback Machine. Archived from the original on 17 July 2011. Retrieved 27 May 2016. ^ "Cambridgeshire guided busway opens to passengers". BBC News. 7 August 2011. Retrieved 15 May 2016. ^ a b Pullinger, Stephen (25 September 2014). "Energy jobs boom fuelled by Great Yarmouth and Lowestoft Enterprise Zone". EDP24. Eastern Daily Press. Retrieved 13 March 2015. ^ a b Dickson, Annabelle (12 January 2012). "Great Yarmouth and Lowestoft enterprise zone interest from around the world". EDP24. Eastern Daily Press. Retrieved 13 March 2015. ^ "The Alconbury Weald Project". Cambridge News. 24 June 2014. Archived from the original on 18 July 2015. Retrieved 13 March 2015. ^ "The Parish Church". Saxmundham. Retrieved 19 April 2016. ^ "Cambridgeshire". Flaginstitute.org/. Flag Institute. Retrieved 4 June 2018. Anna (or Onna; killed 653 or 654) was king of East Anglia from the early 640s until his death. He was a member of the Wuffingas family, the ruling dynasty of the East Angles. He was one of the three sons of Eni who ruled the kingdom of East Anglia, succeeding some time after Ecgric was killed in battle by Penda of Mercia. Anna was praised by Bede for his devotion to Christianity and was renowned for the saintliness of his family: his son Jurmin and all his daughters – Seaxburh, Æthelthryth, Æthelburh and possibly a fourth, Wihtburh – were canonised. Little is known of Anna's life or his reign, as few records have survived from this period. In 631 he may have been at Exning, close to the Devil's Dyke. In 645 Cenwalh of Wessex was driven from his kingdom by Penda and, due to Anna's influence, he was converted to Christianity while living as an exile at the East Anglian court. Upon his return from exile, Cenwalh re-established Christianity in his own kingdom and the people of Wessex then remained firmly Christian. Around 651 the land around Ely was absorbed into East Anglia, following the marriage of Anna's daughter Æthelthryth. Anna richly endowed the coastal monastery at Cnobheresburg. In 651, in the aftermath of an attack by Penda on Cnobheresburg, Anna was forced to flee into exile, perhaps to the western kingdom of the Magonsæte. He returned to East Anglia in about 653, but soon afterwards the kingdom was attacked again by Penda and at the Battle of Bulcamp the East Anglian army, led by Anna, was defeated by the Mercians, and both Anna and his son Jurmin were killed. Anna was succeeded by his brother, Æthelhere. Botolph's monastery at Iken may have been built in commemoration of the king. After Anna's reign, East Anglia seems to have been eclipsed by its more powerful neighbour, Mercia. The East Anglia Array is a proposed series of offshore wind farms to be located around 30 miles off the east coast of East Anglia, in the North Sea, England. It is being developed in partnership by ScottishPower Renewables and Vattenfall. Up to six individual projects could be set up in the area with a maximum capacity of up to 7.2 GW. The first project, East Anglia ONE at 714 MW, received planning consent in June 2014 and contracts in April 2016. Offshore construction began in 2018 and is expected to be completed around 2020. The East Anglia franchise is a railway franchise for passenger trains on the Great Eastern Main Line and West Anglia Main Lines in England. It commenced operating in April 2004 when the Anglia and Great Eastern franchises, together with the West Anglia part of the West Anglia Great Northern franchise, were combined to form the Greater Anglia franchise. Initially operated by National Express East Anglia, in February 2012 it was taken over by Greater Anglia. In May 2015 the Liverpool Street to Chingford/Cheshunt and Enfield Town and Romford to Upminster services transferred to London Overground, and the Liverpool Street to Shenfield services transferred to TfL Rail. Upon being re-tendered in 2016, it was retained by Abellio and rebranded Greater Anglia as specified by the Department for Transport. Edmund the Martyr (also known as St Edmund or Edmund of East Anglia, died 20 November 869) was king of East Anglia from about 855 until his death. Almost nothing is known about Edmund. He is thought to have been of East Anglian origin and was first mentioned in an annal of the Anglo-Saxon Chronicle, written some years after his death. The kingdom of East Anglia was devastated by the Vikings, who destroyed any contemporary evidence of his reign. Later writers produced fictitious accounts of his life, asserting that he was born in 841, the son of Æthelweard, an obscure East Anglian king, whom it was said Edmund succeeded when he was fourteen (or alternatively that he was the youngest son of a Germanic king named Alcmund). Later versions of Edmund's life relate that he was crowned on 25 December 855 at Burna (probably Bures St. Mary in Suffolk), which at that time functioned as the royal capital, and that he became a model king. In 869, the Great Heathen Army advanced on East Anglia and killed Edmund. He may have been slain by the Danes in battle, but by tradition he met his death at an unidentified place known as Haegelisdun, after he refused the Danes' demand that he renounce Christ: the Danes beat him, shot him with arrows and then beheaded him, on the orders of Ivar the Boneless and his brother Ubba. According to one legend, his head was then thrown into the forest, but was found safe by searchers after following the cries of an ethereal wolf that was calling, in Latin, "Hic, Hic, Hic" – "Here, Here, Here". A coinage commemorating Edmund was minted from around the time East Anglia was absorbed by the kingdom of Wessex and a popular cult emerged. In about 986, Abbo of Fleury wrote of his life and martyrdom. The saint's remains were temporarily moved from Bury St Edmunds to London for safekeeping in 1010. His shrine at Bury was visited by many kings, including Canute, who was responsible for rebuilding the abbey: the stone church was rebuilt again in 1095. During the Middle Ages, when Edmund was regarded as the patron saint of England, Bury and its magnificent abbey grew wealthy, but during the Dissolution of the Monasteries, his shrine was destroyed. Medieval manuscripts and works of art relating to Edmund include Abbo's Passio Sancti Eadmundi, John Lydgate's 14th-century Life, the Wilton Diptych and a number of church wall paintings. Guthrum (Old English: Guðrum, died c. 890), christened Æthelstan on his conversion to Christianity in 878, was King of the Danish Vikings in the Danelaw. He is mainly known for his conflict with Alfred the Great. The kingdom of East Anglia, (also known as the kingdom of the East Angles), was a small independent Anglo-Saxon kingdom that comprised what are now the English counties of Norfolk and Suffolk and perhaps the eastern part of the Fens. The kingdom was one of the seven traditional members of the Anglo-Saxon Heptarchy. The East Angles were initially ruled (from the 6th century until 749) by members of the Wuffingas dynasty, named after Wuffa, whose name means 'descendants of the wolf'. The last king was Guthrum II, who ruled in the 10th century. After 749 East Anglia was ruled by kings whose genealogy is not known, or by sub-kings who were under the control of the kings of Mercia. East Anglia briefly recovered its independence after the death of Offa of Mercia in 796, but Mercian hegemony was soon restored by his successor, Coenwulf. Between 826 and 869, following an East Anglian revolt in which the Mercian king, Beornwulf, was killed, the East Angles again regained their independence. In 869 a Danish army defeated and killed the last native East Anglian king, Edmund the Martyr. The kingdom then fell into the hands of the Danes and eventually formed part of the Danelaw. In 918 the East Anglian Danes accepted the overlordship of Edward the Elder of Wessex. East Anglia then became part of the Anglo-Saxon kingdom of England. Many of the regnal dates of the East Anglian kings are considered unreliable, often being based upon computations. Some dates have presented particular problems for scholars: for instance, during the three-year-long period of apostasy that followed the murder of Eorpwald, when it is not known whether any king ruled the East Angles. The main source of information about the early history of the kingdom's rulers is Bede's Ecclesiastical History of the English People. National Express East Anglia (NXEA) was a train operating company in England owned by National Express, that operated the Greater Anglia franchise from April 2004 until February 2012. Originally trading as One, it was rebranded National Express East Anglia in February 2008. It provided local, suburban and express services from London Liverpool Street to destinations in Essex, Hertfordshire, Cambridgeshire, Suffolk and Norfolk in the East of England. The Diocese of East Anglia is a diocese of the Latin Rite of the Roman Catholic Church covering the counties of Cambridgeshire, Norfolk, Suffolk and Peterborough in eastern England. The diocese makes up part of the Catholic Association Pilgrimage. Rædwald (Old English: Rædwald pronounced [rædwɑɫd], 'power in counsel'), also written as Raedwald or Redwald, was a king of East Anglia, an Anglo-Saxon kingdom which included the present-day English counties of Norfolk and Suffolk. He was the son of Tytila of East Anglia and a member of the Wuffingas dynasty (named after his grandfather, Wuffa), who were the first kings of the East Angles. Details about Rædwald's reign are scarce, primarily because the Viking invasions of the 9th century destroyed the monasteries in East Anglia where many documents would have been kept. Rædwald reigned from about 599 until his death around 624, initially under the overlordship of Æthelberht of Kent. In 616, as a result of fighting the Battle of the River Idle and defeating Æthelfrith of Northumbria, he was able to install Edwin, who was acquiescent to his authority, as the new king of Northumbria. During the battle, both Æthelfrith and Rædwald's son Rægenhere were killed. From around 616, Rædwald was the most powerful of the English kings south of the River Humber. According to Bede he was the fourth ruler to hold imperium over other southern Anglo-Saxon kingdoms: he was referred to in the Anglo-Saxon Chronicle, written centuries after his death, as a bretwalda (an Old English term meaning 'Britain-ruler' or 'wide-ruler'). He was the first king of the East Angles to become a Christian, converting at Æthelberht's court some time before 605, whilst at the same time maintaining a pagan temple. In receiving the faith he helped to ensure the survival of Christianity in East Anglia during the apostasy of the Anglo-Saxon kingdoms of Essex and Kent. He is generally considered by historians to be the most favoured candidate for the occupant of the Sutton Hoo ship-burial, although other theories have been advanced. The Stansted Express is a direct train service linking London Liverpool Street to London Stansted Airport. It is a sub-brand of Greater Anglia, the current franchise operator of the East Anglia franchise. The University of East Anglia (UEA) is a public research university in Norwich, England. Established in 1963 on a 320 acres (130 hectares) campus west of the city centre, the university has four faculties and 26 schools of study. The annual income of the institution for 2016–17 was £273.7 million of which £35.6 million was from research grants and contracts, with an expenditure of £262.6 million.The university is ranked 13th in the UK by The Times and Sunday Times, 14th by The Complete University Guide and 18th by The Guardian. Ælfwald (Old English: Alfƿold, "elf-ruler," reigned from 713 to 749) was an 8th-century king of East Anglia, an Anglo-Saxon kingdom that today includes the English counties of Norfolk and Suffolk. The last king of the Wuffingas dynasty, Ælfwald succeeded his father Ealdwulf, who had ruled for forty-nine years. Ælfwald himself ruled for thirty-six years. Their combined reigns, with barely any record of external military action or internal dynastic strife, represent a long period of peaceful stability for the East Angles. In Ælfwald's time, this was probably owing to a number of factors, including the settled nature of East Anglian ecclesiastical affairs and the prosperity brought through Rhineland commerce with the East Anglian port of Gipeswic (modern Ipswich). The coinage of Anglo-Saxon sceattas expanded in Ælfwald's time: evidence of East Anglian mints, markets, and industry are suggested where concentrations of such coins have been discovered. After returning from exile, Æthelbald of Mercia succeeded Coelred and afterwards endowed the church at Crowland. Ælfwald's friendly stance towards Æthelbald helped to maintain peaceful relations with his more powerful neighbour. The Life of Guthlac, which includes information about Æthelbald during his period of exile at Crowland, is dedicated to Ælfwald. Later versions of the Life reveal the high quality of written Old English produced in East Anglia during Ælfwald's reign. He was a literate and devoutly Christian king: his letter written to Boniface in around 747 reveals his diplomatic skills and gives a rare glimpse into the life of a ruler who is otherwise shrouded in obscurity. Æthelberht (Old English: Æðelbrihte, ÆÞelberhte), also called Saint Ethelbert the King (died 20 May 794 at Sutton Walls, Herefordshire), was an eighth-century saint and a king of East Anglia, the Anglo-Saxon kingdom which today includes the English counties of Norfolk and Suffolk. Little is known of his reign, which may have begun in 779, according to later sources, and very few of the coins issued during his reign have been discovered. It is known from the Anglo-Saxon Chronicle that he was killed on the orders of Offa of Mercia in 794. He was subsequently locally canonised and became the focus of cults in East Anglia and at Hereford, where the shrine of the saintly king once existed. In the absence of historical facts, mediaeval chroniclers provided their own details for Æthelberht's ancestry, life as king and death at the hands of Offa. His feast day is 20 May. Several Norfolk, Suffolk and West Country parish churches are dedicated to the saint.